On this date in 1918 the Pittsburgh Pirates and Brooklyn Robins(Dodgers, named Robins at the time for their manager Wilbert Robinson) hooked up for a five player deal that saw two future Hall of Famers change teams. The Pirates sent future HOF pitcher Burleigh Grimes along with fellow pitcher Al Mamaux and shortstop Chuck Ward to the Robins in exchange for second baseman George Cutshaw and outfielder Casey Stengel, the future HOF manager. Cutshaw was 31 at the time of the trade and a veteran of six major league seasons, all with Brooklyn. He played 845 games during those first six seasons, an average of 141 a year when teams played a 154 game schedule. He was a .260 hitter with 350 runs scored, 360 RBIs and 166 stolen bases. He was a strong fielder who had led all second baseman in the NL in assists every year from 1914-16 and also led in putouts every season from 1913-16. In 1917 he finished 2nd in both categories and third in fielding percentage. Stengel had also spent his first six seasons with Brooklyn but he was just 27 years old. He started his first two years as a center fielder but had mainly played right field the last four seasons. He was a .272 hitter in 676 games with 292 RBIs and 77 stolen bases. During the 1917 season he hit .257 with career highs in runs scored with 69, RBIs with 73 and walks with 60. Ward was a 23-year-old rookie in 1917 for the Pirates(he actually shared a birthday with Stengel, July 30). He is the answer to the question of who took over at shortstop for the Pirates after Honus Wagner moved to first base for his final season in 1917. In 125 games, Ward hit .236 with 43 RBIs, but made 50 errors at shortstop. Mamaux had a horrible season in 1917 going 2-11 with a 5.25 ERA but he was just 23 at the time and had gone a combined 42-23 the previous two seasons, winning 21 games each year. Grimes also had a poor season in 1917 finishing the year with a 3-16 record. He was 24 at the time of the deal and had made his debut in September 1916. The Pirates were obviously giving up a lot of youth in the deal, but they were doing it with the hopes of improving on their dismal 1917 season in which they went 51-103. Ward ended up playing five seasons in Brooklyn but he was a seldom used backup, getting only 111 games in during his time there and he hit just .217 in 346 at-bats. Mamaux never had seasons quite like his two big years in Pittsburgh. He was 26-30 in six seasons in Brooklyn, although he did win 22 games during the 1919-20 seasons with a 2.67 ERA. Grimes was the key to the deal for Brooklyn, swinging the trade in their favor. He played nine seasons in Brooklyn winning 158 games, four times winning at least 20 in a season. Stengel lasted two years in Pittsburgh, playing 128 games in which he hit .280 with 55 RBIs. He was traded to the Phillies during the 1919 season for outfielder Possum Whitted. Cutshaw played four seasons in Pittsburgh, giving them strong defense at 2B and a couple good seasons at the plate. He hit .285 with 68 RBIs in 1918 and even though he played just 98 games, he hit .340 with 53 RBIs in 1921. 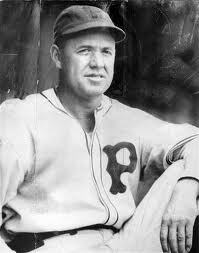 The Pirates would get Grimes back in 1928 and he won a league leading 25 games that year. He followed that up with a 17-7 season in 1929. He also returned for a third tour of duty, finishing his career with the team in 1934. Only one former Pirates player born on this date. Pitcher Harley Payne (1868), who played briefly for the 1899 Pirates. Payne had three previous seasons of major league experience going into 1899, all with Brooklyn. He started his pro career in 1890 for a team from Youngstown, Ohio and spent his first six season in the minors, playing for nine different teams. He made his major league debut in 1896 and as a rookie he had a 14-16, 3.39 record for a bad Brooklyn team. His ERA actually ranked him 8th in the National League, so his record was more indicative of the 10th place team(12 teams in the NL that year) he pitched for rather than the season he had. He followed up that rookie season with a 14-17, 4.63 record in 1897 as Brooklyn moved up to 7th place in the NL. Payne made just one start all season in 1898, an early season game that he won 9-8, pitching a complete game and going 3-4 with three RBIs at the plate. He reappeared the next year on the Pirates roster, pitching the 15th game of the year for Pittsburgh. The team had a 4-10 record going into the game. The Pirates won that day in 11 innings over a Louisville Colonels team filled with future Pirates stars(see link for details). Payne pitched a week later and took the loss against the Reds, then again two weeks later when the Phillies beat the Pirates 6-5 in 10 innings. He made his final start a week later in a loss to the Baltimore Orioles. That was the end to his major league (and pro) career, finishing 30-36, 4.04 in 80 games, 72 as a starter.